Products are offered for manual nucleic acid sequencing, including equipment, reagents, and accessories for sample preparation, sequencing reaction cleanup, electrophoresis, gel drying, imaging, and data analysis. 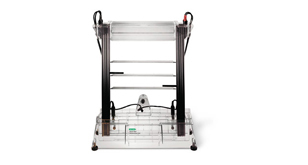 The Sequi-Gen GT nucleic acid sequencing cell makes it easy to cast and run sequencing gels. The system's design ensures smile-free patterns and offers an easy horizontal casting method. Vinyl sharkstooth combs and spacers, multichannel pipet-compatible combs, machined vinyl wedge spacers, plastic combs, and spacers.